Legal DNA Paternity Test. If you are in need of Legal DNA Paternity Testing, you may book your appointment here. Most of the cases we are able to accommodate next day appointments. Actual genetic testing will be performed at the AABB accredited laboratory. AABB is – American Association of Blood Banks an organization that oversees the standards for genetic testing and testing for DNA Paternity. You may have seen paternity testing on television; a man in a black turtleneck proclaiming “YOU ARE (NOT) THE FATHER!” and then an on-air fight ensues for our viewing pleasure. However, in reality, paternity testing isn’t quite so melodramatic. It’s actually quite simple: a paternity test is a DNA (deoxyribonucleic acid which is found in the nucleus of a cell that holds one’s genetic information) test that is used to determine if a man is biologically the father of a child. Each person inherits a distinctive set of DNA from each of their biological parents. So, in the lab, one would need to be able to match a sequence of DNA from the alleged father with that of the babying order to determine if he is indeed going to be a daddy. Determining the biological father of a child is important for many reasons, including parental rights, citizenship, social benefits, immigration, adoption and other instances where legal proof of blood relation is required. Legal DNA testing is what our laboratories specialize in the past 30 years. We do not cut corners or try to save on equipment since we understand that this is the one time that testing will impact your life forever. All of our DNA Paternity Tests are performed by Ph.D. level trained genetic scientists and are acknowledged authorities in the scientific world. Nine of ten top world genetics professionals are employed by our laboratories. Our DNA Paternity Test results are recognized in court in all 50 states, US territories and in every country which accepts ISO standards. If you looking for the most reliable and accurate DNA Paternity test, you should ask yourself a question: why some of the results recognized by the government and some not? The government trusts our DNA paternity test results so much that they are willing to make changes on the birth certificate. This accuracy shows that governments are willing to change official government identification documents. How is DNA Paternity Test collection completed? Veritas Lab DNA collection kit consists of four buccal swabs for each person. Our laboratories deploy 21+ locus technologies, which allow us to exclude the mother from the testing. So for fathers that would like to keep the DNA testing a secret, our DNA Paternity Test is the best solution, since you don’t have to notify the mother about the procedure. We only need a father and the child to be present, so we can collect their genetic materials or you can do it yourself shall you order a home kit. How do I schedule and pay for my DNA Paternity Test? Do I have to pay upfront for DNA Testing? Do you have a DNA Paternity Test without prepayment or deposit? If you are in need of Legal DNA Paternity Testing, you must schedule an appointment first. Most of the cases we are able to accommodate next day appointments. We do not require a deposit and fees for your test can be paid by the end of the business day of your appointment. Please note that the clinic will not accept the payment for your test since they are only a collection facility. Actual genetic testing will be performed at the AABB accredited laboratory. AABB is – American Association of Blood Banks an organization that oversees the standards for genetic testing and testing for DNA Paternity. You have two options to pay. You may log in to your account on our website by clicking HERE and pay online from your computer, tablet or a smartphone, or you may call us at 888-398-0059 to pay over the phone. It is important to submit your payment the same day with your DNA appointment to avoid delays with the DNA Paternity testing process. All home kits DNA Paternity testing must be prepaid. The kit will only be shipped to you after successful debit or credit card payment. For Pre-natal non-invasive DNA Paternity testing, we do require a deposit of $500 dollars. The rest of the sum could be submitted by the end of the business day of your appointment. What is the cost for Legal DNA Paternity Test? How much does the DNA test cost? What is the typical price for genetic DNA Paternity Test? What documents do I need for the DNA Paternity Test? Legal DNA Paternity Test samples must be collected by specially trained and certified professionals. Our technicians will have to verify your identity by checking a photo ID for adults and documents for a child (birth certificate, social security card, medical insurance card or discharge paperwork from the hospital for newborns). Also, our technicians will have to take a picture of every participating party in the collection, date these pictures with signatures. Another important part of DNA sample collection is fingerprinting. Every person involved will have to do a thumbprint at the time of the collection. Veritas Lab uses a non-sticking natural inkpad, which is absolutely harmless even for newborns and can be easily removed with the soft tissue. Price of DNA Paternity Test differs from company to company. The standard range for home kits is anywhere between $200 and $300 dollars. These are price examples for AABB accredited laboratories, which use 21+ marker DNA analysis. You might see a $20 sticker on a kit in your local pharmacy, and might wonder why such a big difference in pricing? The difference is in the quality, accuracy, and validity that is offered by the laboratories and cheap cost in the local store. DNA paternity kit in local pharmacy is just a set of swabs, which not includes the price of the test, results reporting and so on. Veritas Lab does not charge for the kit, you are just paying for the testing itself. Our price of DNA Paternity test includes everything. Also, our price of DNA Paternity Test guarantees you that your test will be performed at the AABB accredited laboratory on American soil, and not somewhere in China. On the other hand, home DNA kits have no legal representation and informational only. Even with the home kits, you want to be sure to get guaranteed accurate results, which our company will be glad to offer. We have a competitive price of $199 for peace-of-mind DNA Paternity kit. All of our DNA Paternity Testing are AABB accredited, and you can rest assured that for the price you are getting the most accurate genetic testing in the world. Another type of DNA test is what we call a Legal DNA Paternity Testing. Results of this test are admissible in a court of law. Based on this results, you can make a change on the birth certificate, apply for social security benefits, take a custody of the child, or refuse a support and alimony if our DNA Paternity Test will prove that the child is not yours. In order for DNA Test for Paternity to be a court admissible, it has to meet certain requirements. Samples must be collected by certified technicians, using DNA Paternity chain of custody form. Father and the child must be identified by documentation (government-issued photo ID for adults. For minors – a copy of birth certificate, Social Security Card, Medical insurance card. Discharge papers from the hospital for infants). Legal DNA Paternity test can be done if the child has no identification. Please let us know if you have no documents for the child, so we can prepare the necessary additional paperwork. Another requirement for Legal DNA paternity test is that it has to be performed at the AABB accredited genetic laboratory. Veritas Lab performs genetic testing to establish a paternity only at AABB accredited laboratories. After DNA collection is performed, it will be securely sealed and packaged in your presence. The collector will sign on the envelope, and you will put your initials. Depends on the state, DNA Paternity kit will be delivered to the laboratory by courier or by FedEx overnight service. When your DNA Paternity sample arrives at the AABB accredited laboratory, the first thing it will be checked for integrity of the s. All DNA Paternity Testing kits with signs of tampering will be rejected for testing. The laboratory technician will have to sign the identity of the sealing. Then your sample will undergo genetic testing by Ph.D.’s specially trained and licensed to perform DNA Paternity test. Results will be revived and signed by two different teams of scientists. The last stage of the DNA testing process is the completion of legal paperwork. Notary public will have to sign and seal your DNA Paternity test results. The DNA Paternity testing process since to be long and complicated, but Veritas Lab report most of the electronic test results within 3-4 days and a hard copy will be sent to your mailing address within 5 business days. If you are on this website and doubt in your relationship to your child crossed your mind, it will never go away. Every time you’ll look at your loved one, in the back of your head “Am the real father?” will cross your mind. It will make you depressed and eventually will have a negative impact on your relationship with your spouse and children. Whether you need a DNA paternity test for peace of mind or you going through a divorce and have a court order, we are here to help. Give us a call and our DNA testing professional will guide you through, explaining every step and advising the best testing option for your situation. Expedited Rapid DNA paternity test results are available for additional fee and upon request. There are a few types of paternity testing: Chronic Villus Sampling (CVS) Amniocentesis (an Amniotic Fluid Test) and the Non-Invasive Paternity test. CVS, typically used to detect Down syndrome or other genetic disorders, is a procedure that produces a karyotype, a picture of a fetus’ chromosomes, takes samples from the placenta. Similarly, Amniocentesis takes a karyotype from the amniotic fluid, or, the fluid that surrounds the baby in the womb (this is the “water” that breaks when women go into labor). However, these two methods are extremely invasive and have been known to cause miscarriages. However, a non-invasive paternity test, like the one provided from Veritas Lab’s state-of-the-art technology, is a safe procedure that takes DNA samples from the mother’s blood which has fetal DNA circulating throughout. Using Veritas Lab Corp’s microarray SNP technology, it is easy to analyze the DNA of the child and the alleged father. This type of testing, exclusively offered from Veritas Lab Corp, combines risk-free blood collection and state-of-the-art SNP microarray technology is the best option for prenatal testing. Similarly, for instances where legal proof of blood relation is necessary for inheritance, estates, and wills are required, we also provide post-mortem DNA Paternity testing. Veritas Lab’s paternity is 99.9% accurate and delivers the fastest results of any other testing lab. Even more, we offer prenatal DNA paternity testing (pre-natal) that can be performed before 10 weeks of pregnancy and we do not require a follow-up test after birth. No other lab in the country offers this convenience. However, sometimes a father isn’t keen on the idea of giving blood for a paternity test. Luckily, Veritas Labs understands that this isn’t the easiest topic of conversation. We now offer “self-knowledge” testing where the identity of all parties is kept anonymous. Furthermore, to make it easier for our customers, we can use samples of DNA ranging from blood and hair to toothbrushes and cigarette butts. With the impeccable customer service that Veritas Labs provides, we work around the clock to give guidance and support until your results are delivered to you. We highly recommend, first, that you talk with one of our knowledgeable representatives in order to receive the test that’s right for you and your needs. Veritas Labs – nationally accredited FDA and AABB laboratories and are licensed to administer court-admissible DNA testing is accepted in courts throughout North America as legal evidence of paternity or non-paternity. Packages range from the standard paternity and maternity testing to sibling-ship, avuncular, and grand-paternity testing. Our legally admissible is accepted in courts throughout North America as legal evidence of paternity or non-paternity. If the legal testing option is chosen, a “chain-of-custody” sample collection process is followed during sample collection to ensure proper witnessing and fingerprinting of the parties involved in the test. We highly recommend that you consult with one of our highly trained representatives before deciding which test is best for you. Veritas Labs is the leading company in regulating paternity test samples. Paternity testing is useful in settling legal disputes between the mother and the father. Here at Veritas Labs, we provide this service at a price that is better than our competitors. Paternity tests compare the DNA of the alleged father and mother to determine the biological father. Our testing procedures are 99% accurate and are efficient in finding the biological father of the child. 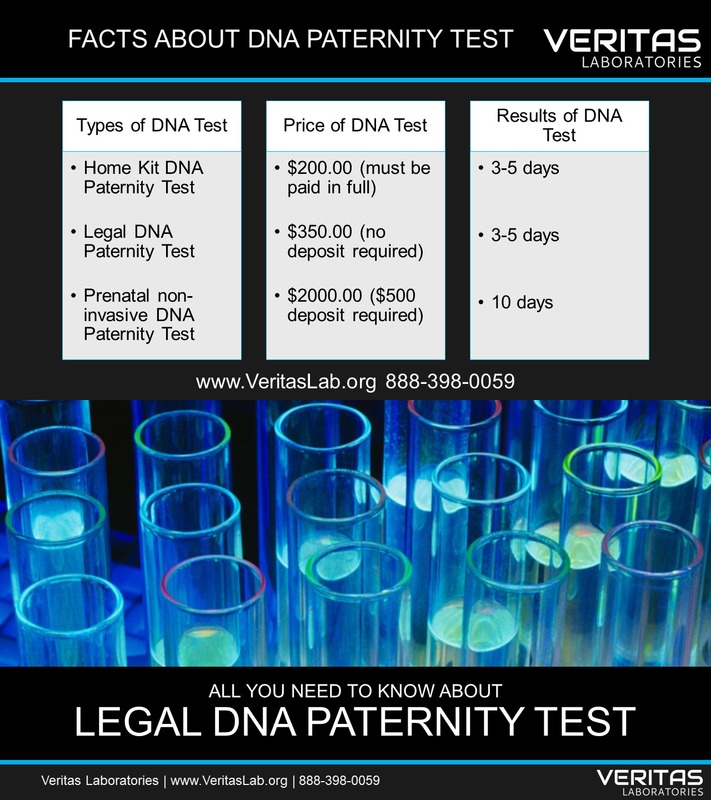 Veritas Lab’s paternity tests cost only $199. At this cheap price, our testing centers will ensure effective, methodical and quick results. Whether you need a paternity test for legal reasons (child support, child custody, medical benefits, etc) or want to find out who is the biological father of your child Veritas Labs brings trustworthy and accurate results. HOW LONG DOES IT TAKE TO RECEIVE DNA PATERNITY TEST RESULTS? Veritas Labs provides results within 3 to 5 days. After specimens from both parties have been collected, Veritas Labs can undergo its procedure to determine the biological father. WHAT IS THE PROCESS TO TAKE A LEGAL DNA PATERNITY TEST? First, the skin cells samples are collected from the father. A soft cotton swab is placed within the mouth of the father. After rubbing his mouth with the swab, the skin cells will be collected. This helps in deciding if the father’s DNA matches the child’s DNA. Veritas Labs’ professional assistant will rub the swab in the cheeks of both the father and the child. If there are additional children that need to be tested, additional fees will apply. Veritas Labs can determine which part of the child’s DNA belongs to its mother if the mother decides to participate in the testing. Unlike our competitors who search for 16 genetic markers, Veritas Labs examines 20 genetic markers. Chain of Custody Legal DNA Paternity Test: This test is primarily used for legal reasons. The results from this test display the name of the biological father of the child. Recommended use: Used for seeking child custody, child support, medical/veteran benefits, adoption, immigration, etc. Basic DNA Paternity Test: Solely used to determine the biological father. However, this test cannot be used for legal evidence. This is because the names of the tested parties will not be stated in the results. Recommended use: A quick and effective way to determine the biological father without displaying the names of the people involved with the test. Our nationally accredited FDA and AABB laboratories are licensed to administer court-admissible DNA testing in all 50 states and US Territories. The packages offered range from standard paternity and maternity testing, to siblingship, avuncular and grand paternity. Our laboratories work with all US embassies to conduct DNA testing for immigration purposes. Separately, we are now offering “self-knowledge” testing where we maintain the anonymity of all of the parties being tested. Typically we collect the DNA samples from the oral cavity utilizing the comprehensive buccal-swab technique, however, we also work with unconventional samples including but not limited to cigarette butts and toothbrushes. For cases that involve matters like estates, wills and other unconventional needs with deceased parties, we offer post-mortem DNA testing. Call us now at 888-398-0059. Veritas Lab Lab is a network of laboratories with more than 30 years of experience in the field of laboratory sciences. Our priority keeping communities, the workplace the country a safe, healthy and less stress consumed. We facilitate DNA Paternity, Urine and Hair follicle Drug and Alcohol tests, and now offer STD testing in all 50 states. Our licensed scientists are certified technicians, fully accredited and recognized throughout the United States assuring the highest standards of accuracy of your test results, which are legally-binding and court-admissible around the country. Our clients continuously voice their high level of comfort as a result of the support and guidance from their first call until they receive their results. Our knowledgeable customer service team works around the clock to answer all of the questions you might have until you have found an appropriate test for your situation. We never lessen our level of commitment, whether you are calling as a national corporation, a small business, an individual or concerned relative or friend. We specialize in DOT compliance and regulations and offer tons of support for someone needing a DNA paternity test. Where can I find a local clinic to do a DNA Test for Paternity? Where can I read more about the DNA test for Paternity in my state? Do you have a QR Code for Legal DNA Paternity Test? 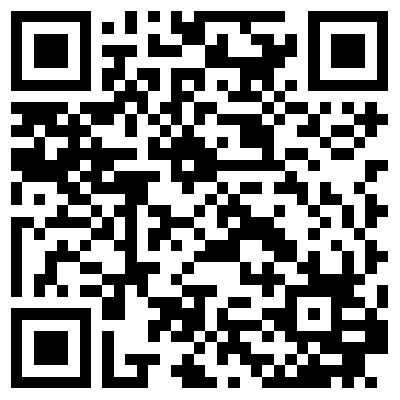 Yes, we do have a QR Code for DNA Paternity Test. Turn on the camera on your smartphone or tablet and scan it so you can read more about Legal DNA Paternity Testing or order it online. Where can I find Veritas Lab clinics to do a DNA Paternity Testing? What are you hashtags for the Legal DNA Paternity Test? Do you have a hashtag for a DNA Paternity Testing at Veritas Lab? Hashtags for Legal DNA Paternity Test? Can I follow the news about Registration for DNA Paternity Test on Facebook And Twitter?